Our typical range includes planing hull forms from 10.5m – 14m. Semi-displacement hull forms from 15m – 24m. Our commercial range extends from 15m to 24m. Hull shape typically follows a semi-displacement form. Any propulsion system can be incorporated into the design including the option of full propeller protection. Encounter Kaikoura have included a new build 16 metre Catamaran (Moana Nui) from Catamaran’s International, into our fleet for the 2017 season. The vessel to date has conducted 480 dolphin swimming tours and carried 13440 passengers. 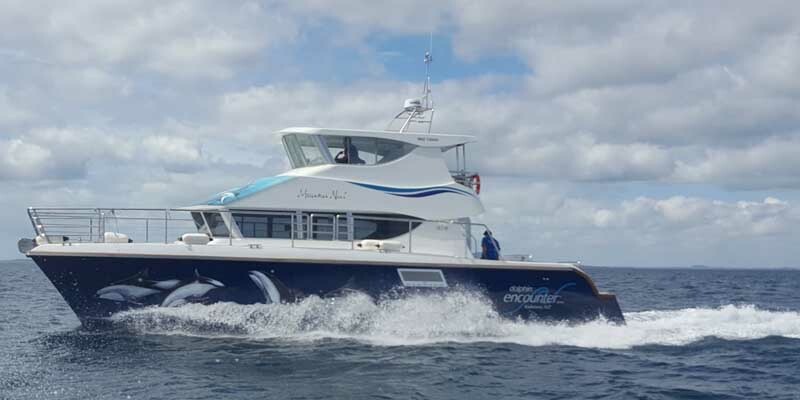 The vessel has a cruise speed of 20 knots and a top speed of 26 knots loaded, it performs very well in both a head sea and a following sea and provides a comfortable ride for passengers in all sea conditions it has operated in, on the Kaikoura coast. The vessels has been built to survey, with design considerations included to ensure it can stand the rigours of daily trailering, as Kaikoura does not have adequate harbour facilities. The layout has seating for 30 passengers inside the main cabin and 12 in the cockpit and 8 in the flybridge. The vessel is finished to a semi commercial finish that allows for easy cleaning and maintains a fresh uncluttered look. Overall the vessel has been built to a high standard using quality fixtures which is evident in the lack of repairs given its commercial use. 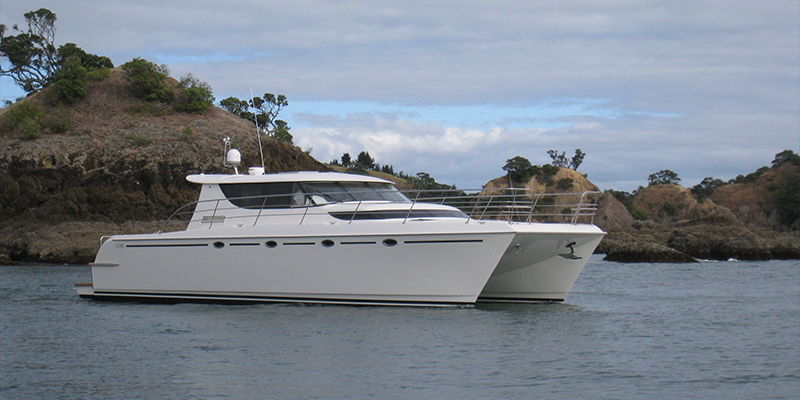 Catamaran’s International has incorporated specific design changes by Encounter Kaikoura, to accommodate its use as a dolphin swimming vessel. I would have no hesitation in recommending this vessel design for commercial use or other. Want to know more about WHAT WE CAN DO TO help you?